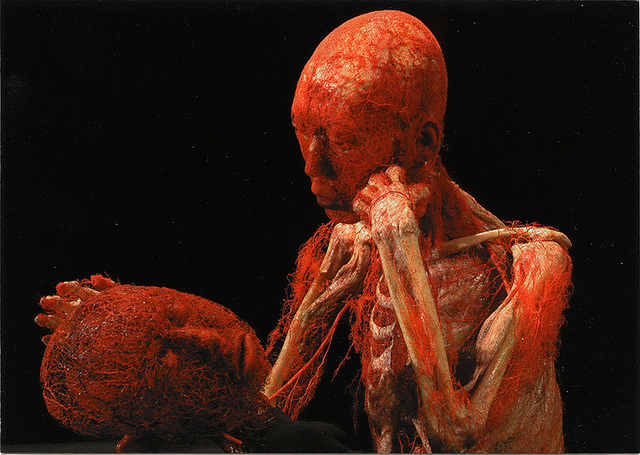 A postcard from the Body World Exhibit. I estimate that at least eight years of my life have been stolen by wicked, sneaky migraines (if you add up all the minutes, hours, and days). The poisoned feeling along with a pounding head first made its debilitating debut into my life in the fifth grade. I was carted off to an eye exam because my teachers thought eye strain might be the cause. It wasn’t. Migraines are my nemesis, my angst, forcing me against the grain of who I am. I use up all fifteen sick days a year at work, plus some vacation, too. What should be relaxing vacation time is spent, instead, lying in the dark with an ice-pack on my head chanting “Please go away.” I feel embarrassed when I have to send the email to my boss and department saying I have to go home, again. Often times, if I’m busy with important tasks, I’ll work through the migraine until I have things under control, and then I go home. I’m lucky to have a compassionate supervisor and department head, who graciously accept this disabling disease of mine. Many people who suffer with migraines aren’t so fortunate and suffer job loss. Studies estimate the economic impact of migraine headache to be in the billions of dollars. I count my blessings. The disease invades many systems in my body: nervous, circulatory, endocrine, muscular, and digestive. I’m not sure the medical community realizes it’s a systemic devil, but I know. It took me 30 years to figure out that dysfunctional digestion is a huge factor in setting off a migraine. Some theorize the body becomes toxic when foods aren’t properly digested or eliminated and that a full colon can cause pressure on the sympathetic nerve centers and on the cerebrospinal system. I don’t know for sure, but I do know my digestion problems are connected—and so are my hormones, blood-sugar, sleep patterns, the weather, and countless other things. Like I said: It’s sneaky. But then, after the migraine leaves and the hang-over subsides, life is grand again. I’ve learned to do everything I can when I feel well, so I won’t be stressed out when I’m sick. As much as I like to get things done, everything is put on hold when the migraine hits and that’s okay. I’ve learned to take all the pressure off of myself when my head is pounding, and relax. Once every couple of years or so, I’m desperate enough to seek medical help. Sadly, Migraineurs are sometimes perceived as drug-seekers. I’m relieved Kaiser doesn’t treat me that way. The nurses and doctors get me in quickly, turn down the lights, and give me an ice-pack without me saying a word. Then they ask me what my usual cocktail is for relief. I say, “Demerol and Phenergan.” Soon I feel some relief from the intense pain and nausea, finally able to sleep when I get home. Even at thirty years-old, I needed my dad to fight on my behalf that day. And he did. He demanded to see the doctor. When the doctor denied me narcotics again, stating they didn’t even carry them in urgent care, my dad stood up and yelled, “Well, can you tell me what to do to help my daughter then? If you people can’t help her with this pain, then tell me where to go or what to do!” I hated witnessing his rage, but I needed him to funnel the anger I could never muster up for myself. Even though I hadn’t told him I was suicidal, I think he knew. His desperation and fear mirrored mine.